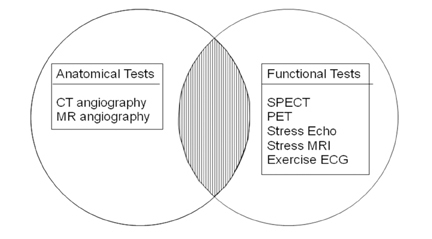 ﻿ Cardiac CT, MR, SPECT, ECHO, and PET: What test, when? Cardiac CT, MR, SPECT, ECHO, and PET: What test, when? Dr. Al-Shehri is a Fellow in Cardiac Imaging, Department of Medicine (Cardiology), University of Ottawa Heart Institute, Ottawa, ON, Canada; Dr. Small is a Cardiac Imaging Fellow, Department of Medicine (Cardiology), University of Ottawa Heart Institute, Ottawa, ON, Canada; and Dr. Chow is the Co-Director of Cardiac Radiology, Director of Cardiac Imaging Fellowship Training, Associate Professor, Departments of Medicine (Cardiology) and Radiology, University of Ottawa Heart Institute, Ottawa, ON, Canada. Dr. Chow is supported by CIHR New Investigator Award #MSH-83718. Cardiovascular disease is the leading cause of morbidity and mortality in the Western world.1,2 With the aging of populations in developed countries and the industrialization of other nations, the prevalence of cardiovascular disease worldwide is likely to increase.3 Critical to management of symptomatic patients is the appropriate use of noninvasive diagnostic tests. At the clinician’s disposal is a large armamentarium of tests, including treadmill stress tests, stress echocardiography (ECHO), myocardial perfusion imaging (MPI)—through both single photon emission computed tomography (SPECT) and positron emission tomography (PET)—CT coronary angiography (CTA), and cardiac magnetic resonance imaging (CMR). Though all are available for the diagnosis and prognostication of patients with suspected and documented coronary artery disease (CAD), selecting the “best test” can be daunting to clinicians.4 An understanding of the patient population, patient pretest probability of CAD, Bayes’ theorem, and the risk, benefits and limitations of each technology will enable the medical imaging professional to assist clinicians with test selection. Cardiac imaging modalities can be divided into 2 broad groups, though some overlap does exist (Figure 1). Modalities such as CTA and CMR angiography provide primarily anatomical data, allowing for the assessment of coronary stenosis. Alternatively, functional imaging modalities such as SPECT, PET, CMR, and stress ECHO provide measures of ischemia. The distinction between anatomical and functional imaging modalities is important because anatomical stenosis does not reliably predict ischemia or hemodynamic significance. Thus, the choice between anatomical and functional modalities potentially depends on the clinical question at hand. Data from randomized trials suggest that low-risk, noninvasive tests have been associated with a hard annual cardiac event rate of <1%.5 These patients can safely be treated medically and investigated further only if their symptoms change or cannot be adequately controlled. This strategy was supported by the results of the Clinical Outcomes Utilizing Revascularization and Aggressive Drug Evaluation (COURAGE) trial, the largest randomized trial of patients with chronic CAD.6 A strategy of optimal medical therapy plus revascularization was not associated with improved outcomes compared with a strategy of optimal medical therapy in 2,287 patients. The nuclear substudy of the COURAGE trial, subsequently published by Shaw et al.7 confirmed the importance of the quantitative noninvasive assessment of perfusion on serial stress SPECT imaging in a subset of 314 patients from the COURAGE trial. Patients who had significant improvement in ischemia, regardless of whether it was achieved by optimal medical therapy plus revascularization or by optimal medical therapy alone, had fewer subsequent hard events (death or non-fatal myocardial infarction). Noninvasive tests answer 2 fundamental questions important to patient care: What is the patient’s diagnosis and what is the patient’s prognosis? Faced with a symptomatically stable patient, the clinician can estimate the patient’s likelihood of having CAD and risk of suffering a future cardiovascular event based upon the history, physical examination, and concomitant cardiac risk factors.8 However, patient diagnosis and prognosis can be further refined with noninvasive imaging. 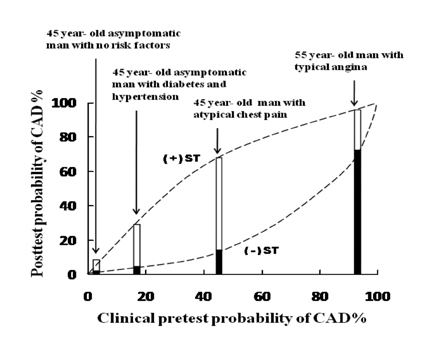 More specifically an individual patient’s pretest likelihood for CAD can be calculated based upon age, gender and typicality of symptoms (Table 1). The assessment of a patient’s pretest is pivotal when deciding whether testing is indicated, selecting an appropriate test, and interpreting the test result. Bayes’ theorem indicates that the post-test probability of a patient having CAD is based upon pretest probability and test accuracy (Figure 2).8 The interplay between pretest accuracy and diagnostic accuracy is of critical importance. In the ideal practice, all patients would have access to the “most accurate test,” and the discussion regarding test selection would be moot. Recognizing that this is not the case, clinicians can often tailor the selection based upon pretest assessment and results. In patients with a high pretest probability of, or already-documented, CAD, noninvasive anatomical imaging with CTA, or CMR angiography (MRA) may play a secondary role to functional imaging. More important to patient care is the understanding of a patient’s prognosis, which will provide pertinent information needed to guide therapy and determine the need for invasive angiography and revascularization. 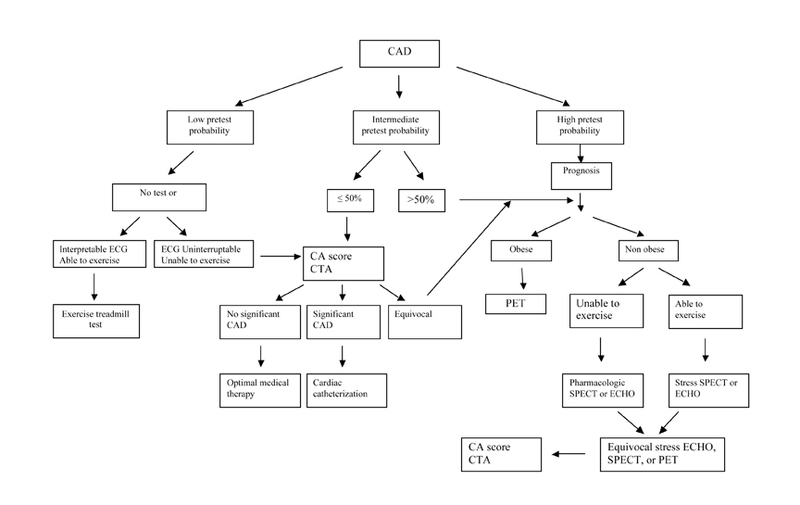 Patients deemed to be at high pretest probability of having CAD may be risk stratified by SPECT, PET, stress ECHO or CMR. MPI with SPECT is a commonly available test. Though exercise is the stressor of choice, vasodilator stress is indicated in patients with left bundle branch block (LBBB), for those who cannot exercise, and those who cannot achieve their target heart rate.9,10 Vasodilators, such as adenosine and dipyridamole, can exacerbate bronchospasm; therefore, they are contraindicated in patients with severe asthma and are replaced with dobutamine. A meta-analysis of 79 studies totaling 8,964 patients showed an overall diagnostic sensitivity and specificity of SPECT MPI of 86% and 74%, respectively.11 SPECT has the ability to identify disease in individual coronary arteries, and since the perfusion abnormalities correlate closely with coronary artery perfusion territories, MPI can be used to direct coronary intervention.12 There is robust evidence supporting the prognostic value of SPECT MPI and its ability to risk stratify patients with suspected or documented CAD. Specific features identify patients at high risk of future cardiac events and thus enable selection of those patients most appropriate for invasive investigations and coronary intervention (Figure 3, Table 2). PET is increasingly available and its accuracy appears to be superior to that of SPECT MPI. The mean sensitivity and specificity of PET in CAD diagnosis have been found to be 89% (83% to 100%) and 90% (73% to 100%), respectively.13-19 PET’s superior diagnostic accuracy is attributed to its better spatial resolution, coincidence detection, and accurate attenuation correction. Such advantages may be particularly relevant in the increasingly obese population, which is typically vulnerable to soft tissue attenuation artifact and has poor acoustic ECHO windows. Bateman et al. compared the diagnostic accuracy of Rb-82 myocardial perfusion PET to Tc-99m sestamibi SPECT. PET’s diagnostic accuracy was higher than SPECT’s (89% versus 79%) and was higher in all populations, including the obese patients. Furthermore, the researchers demonstrated that image quality was excellent in 78% of PET scans compared to 62% of SPECT studies.20 The benefits of PET, however, must be balanced by the financial pressures of modern healthcare systems and the need for fiscal restraint. PET has the additional benefit of quantifying myocardial blood flow (MBF) using N13 ammonia, O15 water and Rb-82 z9F (Figure 4).23-26 The advantage of flow quantification is its potential ability to detect patients with balanced triple vessel disease and possibly to permit early detection of endothelial dysfunction. The diagnostic and prognostic value of quantitative coronary blood flow is being explored. Stress echocardiography has been used to assess the functional significance of CAD35,36 and to risk stratify patients with known or suspected disease. Exercise and pharmacologic stress echocardiography are widely accessible, less expensive, and typically well tolerated. Stress ECHO is appropriate for symptomatic patients with an intermediate pretest probability of CAD and contraindication to regular treadmill stress testing.36 Using stress ECHO, myocardial ischemia is characterized as a worsening or new wall motion abnormality. 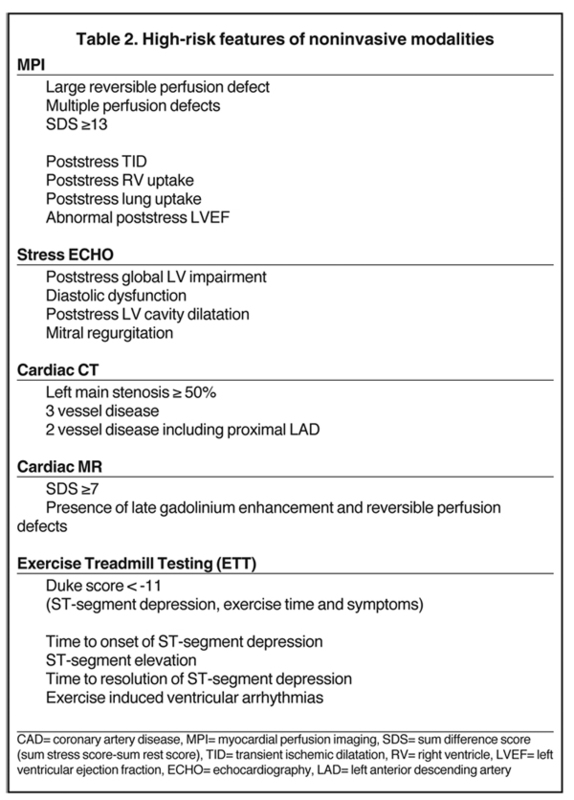 Specific diagnostic criteria for severe CAD can be identified by stress ECHO (Table 2). As with routine ECHO, the accuracy of stress ECHO is greatly dependent upon local expertise. As well, study quality is limited by patient factors such as body habitus and adequate acoustic windows; however, the implementation of contrast agents may enhance ECHO accuracy.45 In the future, echocardiographic MPI may be used to supplement regional wall motion changes to augment the accuracy of this technique. The intermediate pretest population is the group most commonly encountered in the outpatient clinic setting and most likely to benefit from diagnostic and prognostic testing. Accurate diagnosis and prognosis are important to patient care. 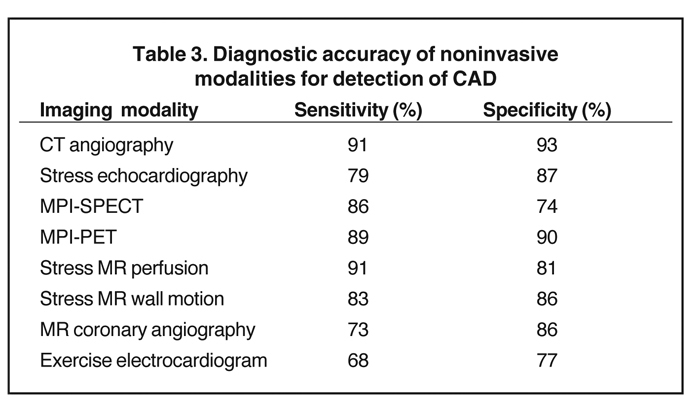 Cardiac imaging modalities have very good accuracy with the potential to guide patient management (Table 3). Every patient should be evaluated clinically for pretest probability for CAD and risk of future cardiovascular events. Patients with intermediate and high pretest probability could potentially benefit from testing for either diagnosis or prognosis. Test selection should be based upon patient factors, recognizing that each technique has its limitations and that not all techniques are readily available. An algorithm can be used to guide clinicians through the myriad noninvasive modalities (Figure 7). World Heart Orgnization. The double burden: Emerging epidemics and persistent problems. In: The World Health Report 1999;13-27. Rosamond W, Flegal K, Furie K, et al. Heart disease and stroke statistics &ndash; 2008 update: A report from the American Heart Association Statistics Committee and Stroke Statistics Subcommittee. Circulation. 2008;117:25-146. Arsenault BJ, Pibarot P, Després JP. The quest for the optimal assessment of global cardiovascular risk: Are traditional risk factors and metabolic syndrome partners in crime? Cardiology. 2009;113:35-49. Patel MR, Spertus JA, Brindis RG, et al. ACCF proposed method for evaluating the appropriateness of cardiovascular imaging. J Am Coll Cardiol. 2005;46:1606-1613. Gibbons RJ. Noninvasive diagnosis and prognosis assessment in chronic coronary artery disease: Stress testing with and without imaging perspective. Circ Cardiovasc Imaging. 2008;1:257-269. 6Boden WE, O’Rourke RA, Teo KK, et al. Optimal medical therapy with or without PCI for stable coro-nary disease. N Engl J Med. 2007;356:1503-1516. Shaw LJ, Berman DS, Maron DJ, et al. Optimal medical therapy with or without percutaneous coronary intervention to reduce ischemic burden: Results from the Clinical Outcomes Utilizing Revascularization and Aggressive Drug Evaluation (COURAGE) trial nuclear substudy. Circulation. 2008;117:1283-1291. Gibbons RJ, Balady GJ, Beasley JW, et al. ACC/AHA guidelines for exercise testing: Executive summary. A report of the American College of Cardiology American Heart Association Task Force on Practice Guidelines (Committee on Exercise Testing). Circulation. 1997;96:345-354. Klocke FJ, Baird MG, Lorell BH, et al. ACC/AHA/ASNC Guidelines for the clinical use of cardiac radionuclide imaging-Executive Summary: A report of the American College of Cardiology/American Heart Association Task Force on Practice Guidelines (ACC/AHA/ASNC Committee to revise the 1995 guidelines for the clinical use of cardiac radionuclide imaging). Circulation. 2003;108:1404-1418. Hendel RC, Berman DS, Di Carli MF, et al. ACCF/ASNC/ACR/AHA/ASE/SCCT/SCMR/SNM 2009 appropriate use criteria for cardiac radionuclide imaging: A report of the American College of Cardiology Foundation Appropriate Use Criteria Task Force, the American Society of Nuclear Cardiology, the American College of Radiology, the American Heart Association, the American Society of Echocardiography, the Society of Cardiovascular Computed Tomography, the Society for Cardiovascular Magnetic Resonance, and the Society of Nuclear Medicine. Circulation. 2009;119:e561-e587. Underwood SR, Anagnostopoulos C, Cerqueira M, et al. Myocardial perfusion scintigraphy: The evidence. Eur J Nucl Med Mol Imaging. 2004;31:261-291. Elhendy A, Sozzi FB, van Domburg RT, et al. Accuracy of exercise stress technetium 99m sestamibi SPECT imaging in the evaluation of the extent and location of coronary artery disease in patients with an earlier myocardial infarction. J Nucl Cardiol. 2000;7:432-438. Schelbert HR, Wisenberg G, Phelps ME, Gould KL. Noninvasive assessment of coronary stenoses by myocardial imaging during pharmacologic coronary vasodilation. VI. Detection of coronary artery disease in human beings with intravenous N-13 ammonia and positron computed tomography. Am J Cardiol. 1982;49:1197-1207. Yonekura Y, Tamaki N, Senda M, et al. Detection of coronary artery disease with 13N-ammonia and high-resolution positron-emission computed tomography. Am Heart J. 1987;113:645-654. Gould KL, Goldstein RA, Mullani NA, Kirkeeide RL, et al. Noninvasive assessment of coronary stenoses by myocardial perfusion imaging during pharmacologic coronary vasodilation. VIII. 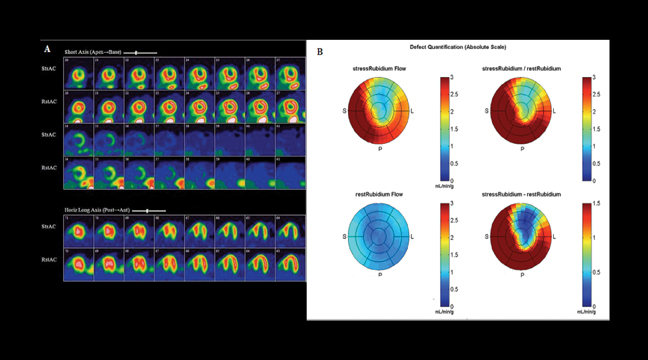 Clinical feasibility of positron cardiac imaging without a cyclotron using generator-produced rubidium-82. J Am Coll Cardiol.1986;7:775-789. Williams B, Mullani N, Jansen D, Anderson B. A retrospective study of the diagnostic accuracy of a community hospital-based PET center for the detection of coronary artery disease using rubidium-82. J Nucl Med. 1994;35:1586-1592. Simone GL, Mullani NA, Page DA, Anderson BA Sr. Utilization statistics and diagnostic accuracy of a nonhospital-based positron emission tomography center for the detection of coronary artery disease using rubidium-82. Am J Physiol Imaging. 1992;7:203-209. Sampson UK, Dorbala S, Limaye A, et al. Diagnostic accuracy of rubidium-82 myocardial perfusion imaging with hybrid positron emission tomography/computed tomography in the detection of coronary artery disease. J Am Coll Cardiol. 2007; 49:1052-1058. Bateman TM, Heller GV, McGhie AI, et al. Diagnostic accuracy of rest/stress ECG-gated Rb-82 myocardial perfusion PET: Comparison with ECG-gated Tc-99m sestamibi SPECT. J Nucl Cardiol. 2006;13:24-33. Chow BJ, Wong JW, Yoshinaga K, et al. Prognostic significance of dipyridamole-induced ST depression in patients with normal 82Rb PET myocardial perfusion imaging. J Nucl Med. 2005;46:1095-1101. Yoshinaga K, Chow BJ, Williams K, et al. What is the prognostic value of myocardial perfusion imaging using rubidium-82 positron emission tomography? J Am Coll Cardiol. 2006;48:1029-1039. Herzog BA, Husmann L, Valenta I, et al. Long-term prognostic value of 13N-ammonia myocardial perfusion positron emission tomography added value of coronary flow reserve. J Am Coll Cardiol. 2009;54:150-156. Iida H, Kanno I, Takahashi A, et al. Measurement of absolute myocardial blood flow with H215O and dynamic positron-emission tomography. Strategy for quantification in relation to the partial-volume effect. Circulation. 1988;78:104-115. Hutchins GD, Schwaiger M, Rosenspire KC, et al. Noninvasive quantification of regional blood flow in the human heart using N-13 ammonia and dynamic positron emission tomographic imaging. J Am Coll Cardiol. 1990;15:1032-1042. Herrero P, Markham J, Shelton ME, et al. Noninvasive quantification of regional myocardial perfusion with rubidium-82 and positron emission tomography. Exploration of a mathematical model. Circulation. 1990;82:1377-1386. Strzelczyk J, Attili A. Cardiac magnetic resonance evaluation of myocardial viability and ischemia. Semin Roentgenol. 2008;43:193-203. Hundley WG, Bluemke DA, Finn JP, et al. ACCF/ACR/AHA/NASCI/SCMR 2010 expert consensus document on cardiovascular magnetic resonance: A report of the American College of Cardiology Foundation Task Force on Expert Consensus Documents. Circulation. 2010;121:2462-2508. Nandalur KR, Dwamena BA, Choudhri AF, et al. Diagnostic performance of stress cardiac magnetic resonance imaging in the detection of coronary artery disease: A meta-analysis. J Am Coll Cardiol. 2007;50:1343-1353. Jahnke C, Nagel E, Gebker R, et al. Prognostic value of cardiac magnetic resonance stress tests: Adenosine stress perfusion and dobutamine stress wall motion imaging. Circulation. 2007;115:1769-1776. Bluemke DA, Achenbach S, Budoff M, et al. Noninvasive coronary artery imaging: Magnetic resonance angiography and multidetector computed tomography angiography: A scientific statement from the American Heart Association committee on cardiovascular imaging and intervention of the council on cardiovascular radiology and intervention, and the councils on clinical cardiology and cardiovascular disease in the young. Circulation. 2008;118:586-606. Thomsen HS. How to avoid nephrogenic systemic fibrosis: Current guidelines in Europe and the United States. Radiol Clin North Am. 2009;47:871-875. Berman DS, Hachamovitch R, Shaw LJ, et al. 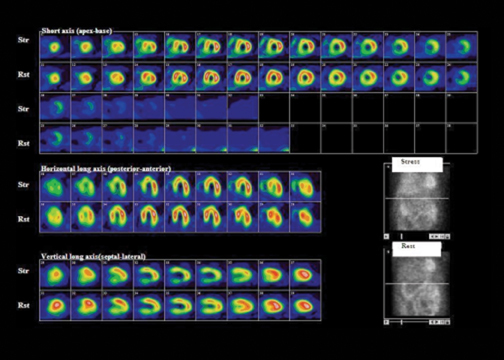 Roles of nuclear cardiology, cardiac computed tomography, and cardiac magnetic resonance: Noninvasive risk stratification and a conceptual framework for the selection of noninvasive imaging tests in patients with known or suspected coronary artery disease. J Nucl Med. 2006;47:1107-1118. Schuijf JD, Bax JJ, Shaw LJ, et al. Meta-analysis of comparative diagnostic performance of magnetic resonance imaging and multislice computed tomography for noninvasive coronary angiography. Am Heart J. 2006;151:404-411. Pellikka PA, Nagueh SF, Elhendy AA, et al. American Society of Echocardiography recommendations for performance, interpretation, and application of stress echocardiography. J Am Soc Echocardiogr. 2007;20:1021-1041. Douglas PS, Khandheria B, Stainback RF, et al. ACCF/ASE/ACEP/AHA/ASNC/SCAI/SCCT/SCMR 2008 appropriateness criteria for stress echocardiography: A report of the American College of Cardiology Foundation Appropriateness Criteria Task Force, American Society of Echocardiography, American College of Emergency Physicians, American Heart Association, American Society of Nuclear Cardiology, Society for Cardiovascular Angiography and Interventions, Society of Cardiovascular Computed Tomography, and Society for Cardiovascular Magnetic Resonance endorsed by the Heart Rhythm Society and the Society of Critical Care Medicine. J Am Coll Cardiol. 2008;51:1127-1147. Fleischmann KE, Hunink MG, Kuntz KM, Douglas PS. Exercise echocardiography or exercise SPECT imaging? A meta-analysis of diagnostic test performance. JAMA. 1998;280:913-920. Quinones MA, Verani MS, Haichin RM, et al. Exercise echocardiography versus 201Tl single-photon emission computed tomography in evaluation of coronary artery disease. Analysis of 292 patients. Circulation 1992; 85:1026-1031. McCully RB, Roger VL, Mahoney DW, et al. Outcome after normal exercise echocardiography and predictors of subsequent cardiac events: Follow-up of 1,325 patients. J Am Coll Cardiol. 1998;31:144-149. Elhendy A, Mahoney DW, Burger KN, et al. Prognostic value of exercise echocardiography in patients with classic angina pectoris. Am J Cardiol. 2004;94:559-563. Arruda-Olson AM, Juracan EM, Mahoney DW, et al. Prognostic value of exercise echocardiography in 5,798 patients: Is there a gender difference? J Am Coll Cardiol. 2002;39:625-631. McCully RB, Roger VL, Mahoney DW, et al. Outcome after abnormal exercise echocardiography for patients with good exercise capacity: Prognostic importance of the extent and severity of exercise-related left ventricular dysfunction. J Am Coll Cardiol. 2002;39:1345-1352. Marwick TH, Case C, Vasey C, et al. Prediction of mortality by exercise echocardiography: A strategy for combination with the Duke treadmill score. Circulation.2001;103:2566-2571. Schinkel AF, Bax JJ, Elhendy A, et al. Long-term prognostic value of dobutamine stress echocardiography compared with myocardial perfusion scanning in patients unable to perform exercise tests. Am J Med. 2004;117:1-9. Mulvagh SL, Rakowski H, Vannan MA, et al. American Society of Echocardiography consensus statement on the clinical applications of ultrasonic contrast agents in echocardiography. J Am Soc Echocardiogr. 2008;21:1179-1201. Hendel RC, Patel MR, Kramer CM, et al. ACCF/ACR/SCCT/SCMR/ASNC/NASCI/SCAI/SIR 2006 appropriateness criteria for cardiac computed tomography and cardiac magnetic resonance imaging: A report of the American College of Cardiology Foundation Quality Strategic Directions Committee Appropriateness Criteria Working Group, American College of Radiology, Society of Cardiovascular Computed Tomography, Society for Cardiovascular Magnetic Resonance, American Society of Nuclear Cardiology, North American Society for Cardiac Imaging, Society for Cardiovascular Angiography and Interventions, and Society of Interventional Radiology. J Am Coll Cardiol. 2006;48:1475-1497. Skinner JS, Smeeth L, Kendall JM, et al. NICE guidance. Chest pain of recent onset: Assessment and diagnosis of recent onset chest pain or discomfort of suspected cardiac origin. Heart. 2010;96:974-978. Chow BJ, Abraham A, Wells GA, et al. Diagnostic accuracy and impact of computed tomographic coronary angiography on utilization of invasive coronary angiography. Circ Cardiovasc Imaging. 2009;2:16-23. Chow BJW, Wells GA, Chen L, et al. Prognostic value of 64-slice cardiac computed tomography: Severity of coronary artery disease, coronary atherosclerosis and left ventricular ejection fraction. J Am Coll Cardiol. 2010;55:1017-1028. Lau GT, Ridley LJ, Schieb MC, et al. Coronary artery stenoses: Detection with calcium scoring, CT angiography, and both methods combined. Radiology. 2005;235:415-422. Abdulla J, Abildstrom SZ, Gotzsche O, et al. 64-multislice detector computed tomography coronary angiography as potential alternative to conventional coronary angiography: A systematic review and meta-analysis. Eur Heart J. 2007;28:3042-3050. Leber AW, Knez A, Von Ziegler F, et al. Quantification of obstructive and nonobstructive coronary lesions by 64-slice computed tomography: A comparative study with quantitative coronary angiography and intravascular ultrasound. J Am Coll Cardiol. 2005;46:147-154. Raff GL, Gallagher MJ, O’Neill WW, Goldstein JA. Diagnostic accuracy of noninvasive coronary angiography using 64-slice spiral computed tomography. J Am Coll Cardiol. 2005;46:552-557. Budoff MJ, Dowe D, Jollis JG, et al. Diagnostic performance of 64-multidetector row coronary computed tomographic angiography for evaluation of coronary artery stenosis in individuals without known coronary artery disease: Results from the prospective multicenter ACCURACY (Assessment by Coronary Computed Tomographic Angiography of Individuals Undergoing Invasive Coronary Angiography) trial. J Am Coll Cardiol. 2008;52:1724-1732. Ostrom MP, Gopal A, Ahmadi N, et al. Mortality incidence and the severity of coronary atherosclerosis assessed by computed tomography angiography. J Am Coll Cardiol. 2008;52:1335-1343. Van Werkhoven JM, Gaemperli O, Schuijf JD, et al. Multislice computed tomography coronary angiography for risk stratification in patients with an intermediate pretest likelihood. Heart. 2009;95:1607-1611. Chow BJW, Larose E, Bilodeau S, et al. The &lsquo;what, when, where, who and how?’ of cardiac computed tomography in 2009: Guidelines for the clinician. Can J Cardiol. 2009;25:135-139. Shuman WP, Branch KR, May JM, et al. Prospective versus retrospective ECG gating for 64-detector CT of the coronary arteries: Comparison of image quality and patient radiation dose. Radiology. 2008;248:431-437. Labounty TM, Leipsic J, Min JK, et al. Effect of padding duration on radiation dose and image interpretation in prospectively ECG-triggered coronary CT angiography. AJR Am J Roentgenol. 2010;194:933-937. Gianrossi R, Detrano R, Mulvihill D, et al. Exercise-induced ST depression in the diagnosis of coronary artery disease. A meta-analysis. Circulation. 1989;80:87-98. Johnson GG, Decker WW, Lobl JK, et al. Risk stratification of patients in an emergency department chest pain unit: Prognostic value of exercise treadmill testing using the Duke score. Int J Emerg Med. 2008;1:91-95. Mark DB, Hlatky MA, Harrell FE, et al. Exercise treadmill score for predicting prognosis in coronary artery disease. Ann Intern Med. 1987;106:793-800. Miranda CP, Lehmann KG, Froelicher VF. Correlation between resting ST segment depression, exercise testing, coronary angiography, and long-term prognosis. Am Heart J. 1991;122:1617-1628. Ellestad MH, Thomas L, Ong R, Loh J. The predictive value of the time course of ST segment depression during exercise testing in patients referred for coronary angiograms. Am Heart J. 1992;123:904-908. Chahine RA, Raizner AE, Ishimori T. The clinical significance of exercise-induced ST-segment elevation. Circulation. 1976;54:209-213. 66. Yang JC, Wesley RC, Jr., Froelicher VF. Ventricular tachycardia during routine treadmill testing. Risk and prognosis. Arch Intern Med. 1991;151:349-353. 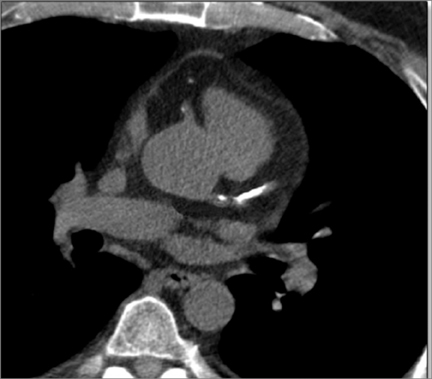 Cardiac CT, MR, SPECT, ECHO, and PET: What test, when?. Appl Radiol.